Nail Yakupov was selected second overall by the Sarnia Sting in the 2010 Canadian Hockey League (CHL) Import Draft. Prior to this, he played in the Russian Minor Hockey League (MHL) for his hometown team, the Reaktor Nizhnekamsk, but thought that trying to join the Ontario Hockey League (OHL) would be a quicker path to his dream to play in the National Hockey League. On February 28, 2011, at 3:07 in the first period of a game against the Sault St. Marie Greyhounds, Yakupov scored his 43rd goal of the 2010–11 OHL season, giving him the new goal-scoring record for a rookie for the Sarnia Sting. 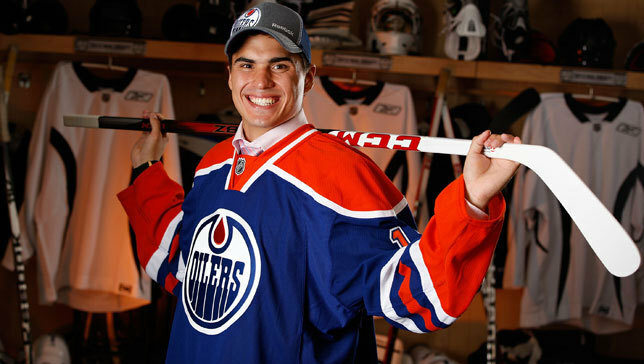 During the NHL Entry Draft on June 23, 2012, Yakupov was picked first overall by the Edmonton Oilers. On July 23, 2012, the Edmonton Oilers signed Yakupov to a 3-year entry level contract. Nail Yakupov has, in a short time, captured the hearts of hockey fans in Edmonton and beyond. He is a gifted natural goal scorer and has already risen to the occasion for the Oilers. His "Tying Goal" versus the Kings and subsequent celebration may have ruffled some feathers but it surely will be talked about for years. 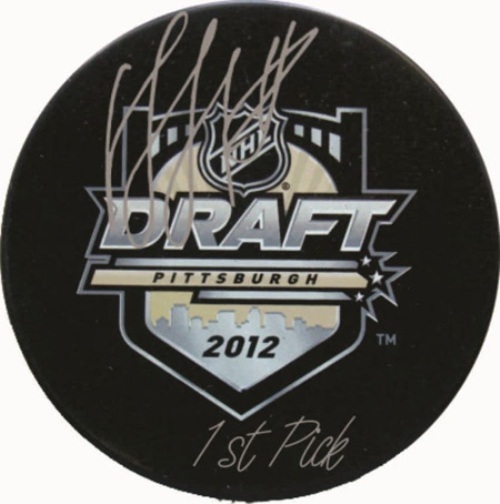 This Draft Day Puck is a great collectible and makes a perfect gift for the hockey fan in your life. Nail Yakupov autograph and hand written "1st Pick"
**These are not stamped signatures, rather hand-signed by the player and as such, no two are alike. Accordingly, while your puck will contain all the same features as the sample picture, the signature will not be exactly the same as pictured.